Green Chemistry is a New trend or buzz word to design safer chemicals and processes. It minimizes the negative impact of chemicals on the environment and helps in achieving sustainability in the chemical production. 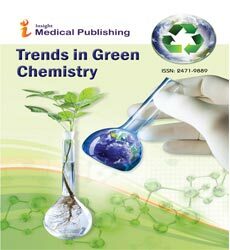 The desire of chemists to make products that are effective and economical expanded the scope of Green Chemistry. The practice of green chemistry not only leads to environmental benefits, but also for the economic and social benefits. The combination of these three benefits is known as the "triple bottom line" and provides strong encouragement to develop sustainable products and processes. Though Green chemistry is not a solution to all the environmental problems, it is a fundamental approach to prevent pollution as it is better to prevent waste than to treat it after it is formed. Environmental Chemistry is the discipline which includes the environmental impact of pollutants, the reduction of contamination and management of the environment. It is thus the study of the behaviour of pollutants with respect to their environmental fate and effects on the environment. Environmental Chemistry may be broken down into two main focus areas viz. the measurement of pollutant levels and the study of pollutant behaviour. Sustainable Chemistry is a scientific concept that seeks to improve the efficiency with which natural resources are used to meet human needs for chemical products and services. Sustainable chemistry encompasses the design, manufacture and use of efficient, effective, safe and more environmentally benign chemical products and processes. It can ensure eco-efficiency in everything we do, both individually and as a society. Sustainable chemistry also means protecting and extending employment, expertise and quality of life. Agricultural Chemistry is the study of chemistry and biochemistry in their relation to agriculture, especially agricultural production, the utilization of agricultural products, and environmental matters. Microwave Chemistry involves the use of microwave irradiation in carrying out chemical reactions. The approach can be used to efficiently heat a chemical reaction, which can accelerate reaction rates and improve chemical yields. The technique can also be used to selectively heat substances. Analytical Chemistry is the science of obtaining, processing, and communicating information about the composition and structure of matter. Analytical chemists use their knowledge of chemistry, instrumentation, computers, and statistics to solve problems in almost all areas of chemistry and for all kinds of industries. Phytoremediation is the direct use of green plants and their associated microorganisms to stabilize or reduce contamination in soils, sludges, sediments, surface water, or ground water. Sites with low concentrations of contaminants over large cleanup areas and at shallow depths present especially favorable conditions for phytoremediation. It is an alternative technology that can be used along with or in place of mechanical conventional clean-up technologies that often require high capital inputs and are energy intensive. Bioremediation involves degradation of organic contaminants (such as chemicals, heavy metals, oil) in the soil or water, by the action of cultured microorganisms selected for their ability to metabolize the specific contaminants. In a process called bioaugmentation, these microorganisms are introduced into the contaminated environment usually as a liquid, with a proper nutrient mix to stimulate and foster their growth. Green Computing is the study and practice of designing, manufacturing, using, and disposing of computers, servers, and associated subsystems such as monitors, printers, storage devices, and networking and communications systems efficiently and effectively with minimal or no impact on the environment. Renewable Energy is any energy resource that is naturally regenerated over a short time scale and derived directly or indirectly from the sun or from other natural movements and mechanisms of the environment. Renewable energy does not include energy resources derived from fossil fuels, waste products from fossil sources, or waste products from inorganic sources. Biosynthesis is the process in your body that turns simple structures into more complex structures. It can happen within a single cell (or within a single organelle within a cell), or across multiple cells. Sometimes all that is required for biosynthesis is for two substances to physically join together to make a new physical substance, which is called a macromolecule. Biocatalysis is the use of natural catalysts, such as protein enzymes, to perform chemical transformations on organic compounds. Both enzymes that have been more or less isolated and enzymes still residing inside living cells are employed for this task. Phytoextraction is a sub process of phytoremediation in which plants remove dangerous elements or compounds from soil or water, most usually heavy metals, metals that have a high density and may be toxic to organisms even at relatively low concentrations. Degradable Products are the waste products, packaging materials, etc capable of being decomposed chemically or biologically. If the materials are decomposed by microorganisms called as biodegradable materials. Always bio degradable products are preferable because they can’t pollute the environment.